We made our way to the dock. It was a grey but clear day. The still air contrasted the rushing water beneath the wharf. As though it were more a river, the ocean weaved between hulls and pilings, pushing it’s way over the flats and back up the inlets. We were the first to arrive, giving us the pick of our seats. I glanced around for the best vantage point but quickly decided there wasn’t a poor view in the cabin and resigned to the rear starboard bench behind the Captain’s chair. Strategically, this spot would give me quick access to the back deck should I spot something picture worthy. It wasn’t long before the others arrived and we formed a small group of 12. A quick twist and toss of the bowline and Captain Josh ushered the rest inside. The adventure officially began as he clicked the silver safety chain behind him. After a thorough life jacket review, we eased out of the slip and away from the Marina. Weaving through channels and bulbous green islands, the sea looked calm and glassy. Within minutes the tour began. 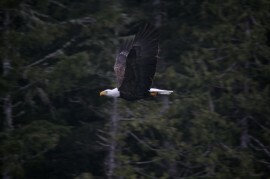 We saw wild sea birds along the shore and in the skies around us. 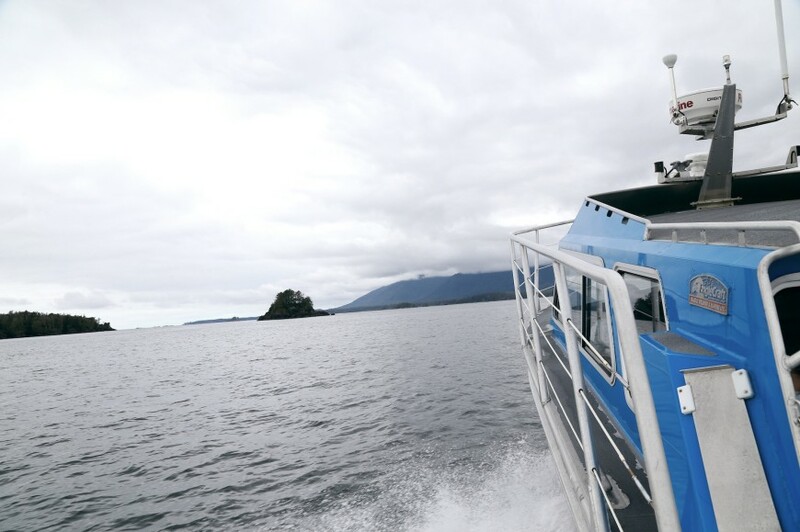 Once clear of the harbour bouys, Captain Josh pushed the throttle and steered past the original town site of Tofino. The tour was comprehensive. We heard stories of local history, the flora and fauna, and personal tales of Captain Josh’s life on the coast. 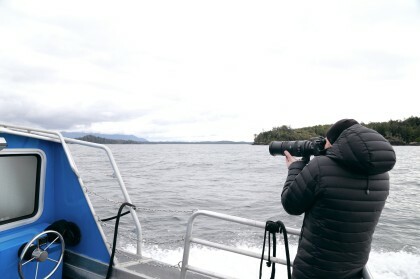 We saw feeding grounds, nesting places, damaged and delicate ecosystems and the wildlife within was unreal; birds, sea lions, seals, eagles, otters, and of course, whales. Other boats cruised around in the distance and the radio chirped with excited voices. 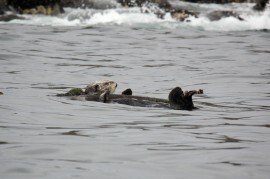 The gray whales were dancing. The professionals referred to it as “socializing”, meaning there is a lot of flapping and slapping and water whipping around. Nobody knows why exactly but it sure was fun to watch! Even on the outer edges of the West Coast, the water was flat and glassy and at times it felt more like skating than floating. As we made our way back to town, I stood outside and let the salt air swish my cheeks as splashes of cold water rained down intermittently. I imagined all the sea life beneath us and how much wild the unruffled seas must be hiding. I felt small yet very much not alone beneath the towering mountains that blurred past. This was it! I found the Wild West Coast that everyone had been referring to! Book Your Marine Adventure Today!